Buy in bulk. It helps reduce waste as it uses less packaging. Use recycled paper and recycle old paper. Ensure you do not leave markers with caps lying open as they will dry out and result in wastage. Buy pencils made of wood rather than plastic. Organise a painting session for employees as an earth friendly stress buster rather than video. Buy pen refills instead of buying new pens each time. Invest in low or non toxic highlighters. Write notes with pencil instead of pen so you can erase and use the paper multiple times. Make your boss a thoughtful card rather than buying expensive gifts and adding to waste. Use an old tin can to make your own pen stand. Be smart as your company gets ready for the year ahead. 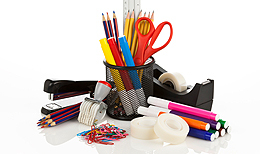 Create your office stationery list that fits within your office budget.